Archaeological objects that reside in museums without ever having been published are almost as lost as objects that are still buried in the ground. Amongst the most striking of such items are Egyptian coffins and mummy-cases, many of which arrived in British collections during the nineteenth and early twentieth centuries. While often very attractive pieces, most have received surprisingly little attention from Egyptological specialists. 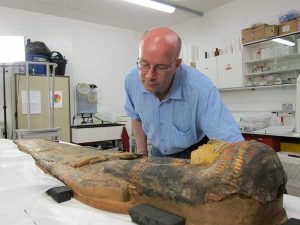 Dr Aidan Dodson of the University of Bristol is carrying out the long-term Egyptian Coffins in Provincial Collections of the United Kingdom Project (http://www.bristol.ac.uk/archanth/research/dodson/ecpuk) to catalogue and publish as many such pieces as possible. Among collections already studied is that of the RAMM, which once held three sets of coffins and their mummies, plus a number of masks and fragments. Unfortunately, two of these sets were discarded some forty years ago; although one coffin survives in the Egypt Centre at Swansea University. The remaining set comprises the very high quality wooden coffin, mummy case and mummy of a married woman named Shepenmut, who lived around the end of the ninth century or beginning of the eighth century BC. Their documentation, and that of all the other coffins and related material ever held by the RAMM, is now available at on-line at http://www.bris.ac.uk/archanth/research/dodson/ecpuk_files/exeter, and will later be published in hard-copy in a volume covering the whole of the South West of England and Wales.